The in-house developed DigiSport Studio application is our main platform for controlling graphics. It is an extremely flexible, script based, GUI that allows control of graphics, sounds, lights and any other external devices. DigiSport Studio can do complex setups where graphics, video, audio, lights and even elements of a set, can all be synced. It also fully supports inter-device control systems, for example buttons or automation systems. The GUI can be customized for each individual project, while still keeping the familiar look for the operator. This ensures that the operator will have a familiar and trusted GUI regardless of what of what output engine is used, and makes for a faster workflow. In addition to the customized GUI it has common features such as tables to store information and a playlist to create run-downs with graphics. In addition to controlling devices, it can read data from all kind of sources including databases, internet feeds and files. 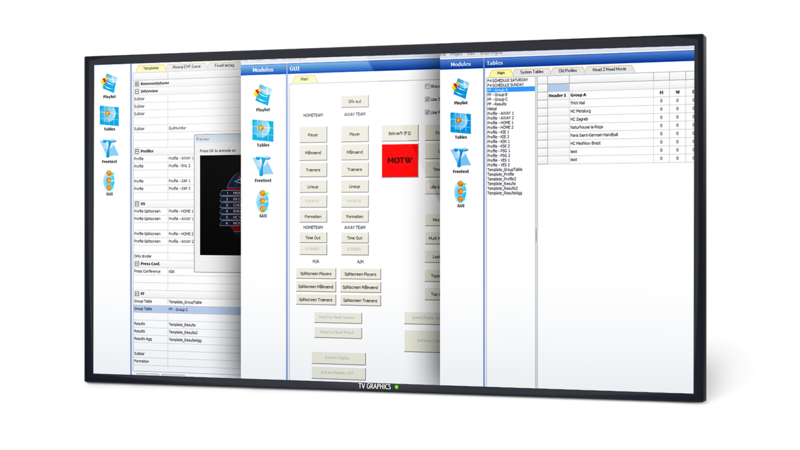 DigiSport Studio is joined with a large number of add-on application for production specific use, such as statistic systems for different sports.